Today the Catholic Church celebrates the feast of St Ignatius of Loyola – the founder of the Society of Jesus (The Jesuits). The Society has over the centuries been known to produce men of great intellect and vision. Apparently, when seeking permission from the Pope to establish the Society, St Ignatius of Loyola, was asked what particular work they would do. He responded that they would do whatever work no one else wanted to. However, Ignatius added that no matter how insignificant that work might be, it should be done in the BEST manner possible. Having interacted with Jesuits (and some semi-Jesuits!) since my youth, I have often heard them use the word “Magis” when talking about Ignatuis’ teachings. “Magis” [pronounced “màh-gis”] is a Latin word which means “the more,” and is taken from the motto of the Jesuits, “Ad Majorem Dei Gloriam” (which means, For the Greater Glory of God). “Magis”, is an exhortation to be MORE – in other words, a call to excellence. 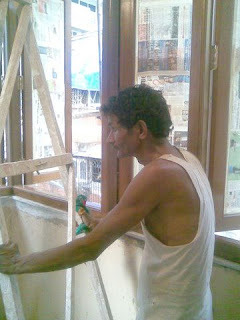 We were priviledged to watch ‘Magis’ in action at our house recently, when the man in the picture, Bindhya Chand (affectionately called ‘Chacha’), was sent to work on our new windows. He was right down in the pecking order of the ‘polishers’. His job was to scrape the wood, in preparation for it to be polished. Chacha came in early every morning and set about his work. He had to basically sandpaper the wood. And later he had to do buffing – rub the wood with a soft cloth. Now you can imagine how monotonous this work is. But he put his whole heart in to it. One afternoon, I realised that he had not had his lunch. When I asked him why, he told me that it looked like it was going to rain and if he didn’t finish his work in time, the wood might get wet!! Frankly, I’ve never seen such diligence displayed for seemingly ‘unimportant’ work. Absolutely amazing! I believe that every human being is called to ‘Magis’ – to be more, to be the best we can be. The question is how are we responding to that call? You are dead rite Corrine..Its about doing the small things consistently, time and again. Magis is a solid example and we can see many such people around us..Great that you are showing all this simple people to the world.. Indeed, inspirational. Reading this story about Surjit makes me realise how far I have to go to raise my standard of work.Those two comments at the end are wonderful. I think I am going to do something about this – better late than never.Thanks Corinne. Once again, a thought-provoking and inspiring post from you. Corinne…your words so beautifully reach out and touch our hearts and minds with realisation of what one needs to do! Thank you so much for your blog! Once again, a heartwarming story. Why story, it is a real life narration.Way to go, Corinne. It is people like this which make us believe that there is still hope for mankind ( to badly paraphrase a famous saying that I am always bad at remembering and reproducing accurately).Everyone needs to love the work he does. Frankly, that is not always the case with me, I must confess.May be I should try harder.